Major Cost Blowout for Midtown Bus Solution? Last year Auckland Transport declared war on the Council over the Victoria Street Linear Park. Just days after being instructed by Council to allow for the future Victoria Street Linear Park, A major part of the City Centre Master Plan and the planned east-west cycling/walking link, AT proposed midtown bus routes that were heavily reliant on Victoria St, thereby preventing the Linear Park. We later found out, through official information requests, that not only did AT’s preferred option prevent the Linear Park, but it was also more expensive and worse for bus users than the alternatives. In fact, their preferred option had a negative benefit-cost ratio, not just a return below 1, but one that was worse for bus users than doing nothing. After a campaign by Greater Auckland, Generation Zero, and Bike Auckland, the Linear Park was saved and AT went back to the drawing board. Later in the year AT released their new compromise option labelled the Crossover. While this led to a good outcome for the Linear Park, it created other issues – both down on Quay Street and by the University. Matt wrote his concerns about here and from which I have included an excerpt below. At the heart of this concern is what Auckland Transport have labelled the ‘crossover’. On paper and at altitude, it appears to be a straightforward and elegant solution to many of the issues of city centre access. However, that falls apart somewhat when you look at the details and think about real world use cases. As a reminder, this is the crossover plan, not shown on here is the City Rail Link, light rail or other buses such as the City Link. Buses from the east of the city centre (such as Gt South, Manukau, and Remuera roads) will turn down Grafton Rd and onto Wellesley St before terminating at the Southern end of Wynyard Quarter. AT are looking at a new bus interchange station in Grafton Gully to allow connections to Symonds St buses. Isthmus buses will travel down Symonds St and terminate at a new bus interchange on Quay St, as will buses from Tamaki Dr. Buses from the Northwest will use Albert St and terminate in Lower Albert St.
North Shore buses will terminate at either Lower Albert St (NEX1 and Onewa Rd services) or in the new interchange at Grafton Gully. After this, the discussion regarding the Midtown Bus Corridor went quiet until recently when AT was about to present their disastrous Regional Land Transport Plan. Thankfully, like their plans to destroy the Linear Park, the draft RLTP was sent back to the drawing board. Bus terminal facilities and associated infrastructure in Lower Albert Street, Quay Street, Wynyard Quarter and the Learning Quarter. A major upgrade of Wellesley Street (from Halsey Street to Symonds Street) to increase the flow of buses to/from the isthmus, north shore to mid-town, additional Link and crosstown services between suburbs in the east and west of the city centre. In last year’s business case the Wellesley Street option with Grafton Gully terminal was $44.5 million while the Victoria Street option was $51.5 million. This aligns with the Auckland Transport Alignment Project, which used non-inflation-adjusted cost estimates of around $40 million broken down to $25 million for the Learning Quarter and $15 million for Wellesley Street itself. The RLTF has two lines of $58.42 million totalling $116.84 million now for the same corridor upgrade and potentially higher as there are other residual City Centre bus priority budget lines. The new preferred Crossover option is over double the cost of the Wellesley ramp option or the use of Wakefield St for outbound services. If the latter, the reason for the blow out might have something to do with the large interchange they were bragging about last year in Grafton Gully. As reported by Simon Wilson in the Spin Off. Up at the universities, they’ll build a big new station just past the Symonds Street underpass. The University of Auckland will put a “gateway building” over it, much as Manukau Institute of Technology sits over the Manukau Railway Station. Why to placate certain “Stakeholders” are we going to spend over double what was expected? How they expect the NZTA and Government to want to co-fund a project that is over double what it needs to be? Why should other projects be pushed back to fund this? Of course, you may have noticed the grand irony of all this, that in the budget lines pictured above, the interchange sits right above the cut-off and right below is cycling. Thanks Harriet. I wonder what the new CEO is going to do about this. And I wonder whether the design is so important to the stakeholders that they’ll fund the difference. A terminal down in a gully, absolutely in the middle of nowhere. Genius. Its up there with their superbly half arsed useless Parnell Railway platform. Meanwhile buses either terminating or departing in the CBD, where most people either go or transfer will remain all over the map, clogging up streets, complimenting nothing. Building anything “over” a bus interchange often leads to very sub optimal outcomes. This is the truest thing ever. This ‘gateway’ Will have motorway/roadcorrdors on 2 sides, so it will only serve a small number of people. Plus the dark and smoggy interchange will be very unsafe for people at night. Could we “reclaim” a bus terminal from the port? To put it close to the rail and ferry termini? Thus creating actual integrated transport? Or at least turn the car park next to Newmarket station into a bus / light rail terminal? Will the Albert / Wellesley bus crossover be joined to the Aotea Station? What is it that planners fail to understand about “network”? Do they need a dictionary? Could we make a condition of entry into AT regular use of the public transport system? Do they realise there is a (University) Kindergarten adjacent to the proposed Symonds / Wellesley interchange, if buses are not 100% electric the children of the educated will be severely disadvantaged. You would think Henry Ford was planning this ludicrousness. Rubber plantation in the Amazon anyone? 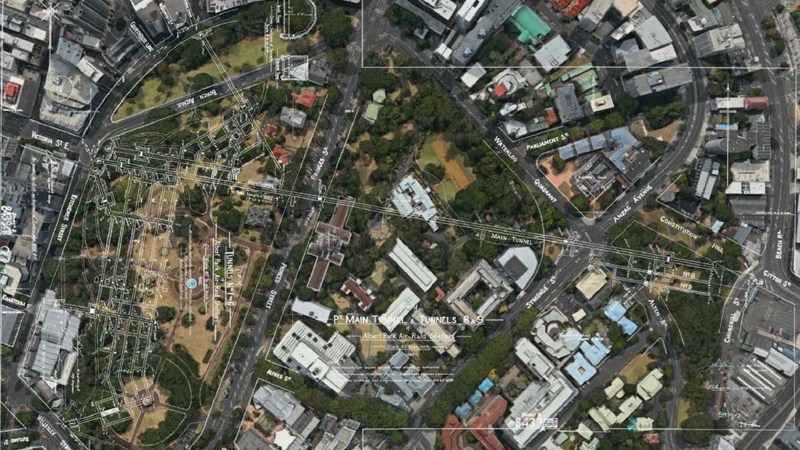 Albert Park would be a great location for a bus station. Just build a large retaining wall along Princes Street and excavate down to the level of Kitchener Street. AT could corral all there noisy diesels in one place so they could sit there idling for 20mins each before heading out in a bus nirvana. Just trying to place my finger on why I think that wouldn’t work. Maybe it’s the trees: Where would we keep the large trees, mfwic? Those large trees big enough to make a difference to air quality, filtering out all the diesel from the buses? Not on private property – we can’t hold up intensification by requiring those to be kept. Not on the road corridors – we need that space, and of course, AT only plants small or medium trees there. I don’t think he’s serious. But imagine if we used all that tunneling equipment to carve out an underground bus station under Albert Park? Pie in sky stuff I know, and too expensive, but a reminder of how short sighted we were not to build an integrated train and bus station at Britomart when we had the chance (but not the money, apparently). Would have been cheap at twice the price, now. And just next to the ferries! Could you expand on the current structure of the Albert Park tunnels? With bus entry/exits on to Wellesley St and on to Churchill St, then place people entrances on to Victoria St (close to the Aotea Station Entrance) and to the university? You could also potentially use the carparking down in Grafton Gully as a depot for terminating services. Right by the Churchill Entrance. You might be able to then reroute the outer link through the station and straight up Parnell Rise from there. And maybe reroute the services on Quay St here instead? Create 1.4ha of new land, with new connections to the Domain, and hide the motorway. Half ground floor is bus park (no stops though, keep them under Symonds St). Use private / Uni funds to build it, so nil cost to ratepayers. In return, developer gets to build up. Not shortlisted for further investigation as the site is challenging from a delivery point of view. It would be expensive to build, and difficult to construct. Sure, difficult to fund if it’s just a busport, however if there’s development above then it could absolutely work. Getting NZTA to release the land to AT and allowing development over a motorway corridor would really be a challenge, but I’d hope the new Minister is open to new ideas! So… we had a bus station/terminus down at Britomart but we demolished it to build an underground train station and sold off the land above it. We had a bus terminal (closed to the public) down at Wynyard Quarter but we sold that to developers as well. Now we don’t have any land in the CBD to build a terminal/transfer station for buses so some bright spark is thinking let’s just build it on that dead land by the motorway. And the University can build on top of it. I think now is not the time for bright sparks. It appears to be a remarkable coincidence that the Wellesley St and Learning Quarter projects will each cost exactly the same, $58.472m, Has there perhaps been a double up? If AT can put up silly impractical ideas, I thought I’d have go as well. I’m not sure I understand the negativity. This looks like the only sensible bus plan I’ve ever seen for Auckland city. Pretty much all buses along two routes with an interchange where they meet, what’s not to like? I largely agree. However, I think it is right to question why what is basically a bus turnaround loop in Grafton Gully is going to cost over $100m. I also think the Quay St bus turnaround plan is absurd. I had to read over the older posts to figure that too. I think it’s because the original cheaper plan was to use the Wellesley slip lane/ramp (right next to the University) to turn (just the northern NX2?) buses around, but primarily due to University resistance that plan has changed. It could be other space etc reasons too though I suspect? The key to any mass transport interchange is the means of vertical circulation. Any interchange built there in the Grafton Gully would, as someone above said, be a cold dark dank smelly place – at ground level. Having spent many years at the School of Architecture right next to it, I know just how steep and tall that flank of the gully is (and it gets great south light in from that direction for drawing, although I’m not sure Auckland students actually draw any more…). If that is going to be a major interchange for students, and therefore also the public as well, then you couldn’t do it with just a couple of lifts. I’d suggest that what would be needed is a decent bank of escalators taking people both up and down. There will be students from AUT as well as Auckland Uni, and the AUT students would probably appreciate being able to get off halfway up the incline. Then there would be the question of Who, exactly, would go in the building? It would probably be about 5-6 stories tall, and only the bottom one needs to be for the buses, so that leaves another 5 floors for another use. May I suggest that it can be for traffic planners? So they can stare out at the endless traffic / streams of bikes / lack of trains, and rue their ways? — ideally, this connection would be enabled to happen as close to where the alignments intersect: Wellesley / Symonds. This will always be the case; these streets won’t move. — currently we’re proposing to spend a lot of money to enable this connection to happen in a relatively remote/challenging location. Again, this will always be the case. — if buses can’t use the ramp, why not close it to all traffic? The uni can’t have it both ways, either traffic is a problem or it’s not. Buses are no more offensive than, say, medium/large trucks. — could we carve into the space currently used for the ramp to fit in a north-side busway on Wellesley, with the main stops under Symonds, and the main access to the platforms from the eastern corner of the intersection, where the creche currently is? I accept this may not work. But I can’t help but feel if we’re going to spend $100 million (which is like 20% of the cost of Britomart), then I think we should get the interchange in the right location. Blue and magenta, according to my screen and eyes. Yes. Completely agree. To link those routes, you need to link tlhem. 🙂 This needs bus stop space and people places. As they are on different levels, it also needs stair / elevator / escalator space. And as both Symonds St and Wellesley St are too wide, ugly, place-ruining legacies of a previous car-dependent era, you don’t have to scratch very far in any of Council or AT’s various vision statements, objectives and guidelines to see that the mandate already exists to repair these places by reallocating road space to a proper people-friendly interchange. As for storing buses during the day, that’s a different question that doesn’t need to ruin all aspects of the planning. What about using the carpark at Mayoral/Albert/Wellesley Streets, behind Bledisloe House? It’s at the intersection of a few of those major bus routes, close to Aotea Square and only a block from the train station. Could build on top too if you’re looking for funding? Might be some space underneath as well for carparking so long as the CRL tunnels aren’t too wide. It’s not a block from the train station, it’s right at the station, and is going to be built on to provide a station entrance and associated development. Even if that wasn’t the case i suspect it would be too small anyway. +1, and if you wanted a bus interchange there you would be better of to use the street space on Wellesley and Albert Streets! Actually, what the hell happened to SkyCity building the damn bus terminal in exchange for erecting that massive convention centre? Did we get shafted here? I’m a bit confused about that too – I imagined that was for intercity buses, but then the talk was all about putting that down in Manukau (which would exclude unaccompanied children from being able to use the service because they are not allowed on if they have to transfer somewhere.) So if it wasn’t for intercity buses because they are going elsewhere, what was it for? Or was the change to Manukau a clever helping hand for SkyCity? We have deep pockets for them, it seems. My understanding is SkyCity want to close the token bus station. It was meant to be the bus station for the North Shore buses which was intended to be on the ground floor and somehow it morphed in to a small piece on the side for long distance buses. I hope the original intention gets insisted on. I also hope someone documents the whole process, so that we can more honestly assess if relying on private corporations to honour the intention of negotiations is possible. Perhaps the level of legal water-tightness required is so high that it’s not even something AT / Council / Aucklanders should consider. I don’t understand what is going on with this project. AT had a perfectly workable bus system for the crossover which built a cheap but very effective interchange under Symonds Street and used the little streets at Britomart as bus terminal. How did they get from that sensible solution to this overblown mess? Why not move it 400 meters down the road to the bottom of Alten Rd? I believe there’s just a parking lot there now, and it has the advantage of being closer to the Carlaw Park business park thing, the Tennis courts and, hopefully, the future shortcut to Parnell train station (and Parnell.) It’d also be technically 400 meters closer to Downtown and the Spark Arena, but perhaps Downtown is far away enough for that to not really be a factor. And, unless I’m mistaken, it’s where one of the entrances to the Albert Park Tunnel will be (if it’s ever done), so, easier access into Mid Town. Perhaps they could even pull the tunnel into the project. This really comes back to the appalling decision to save money by removing the bus terminal from the Britomart design. Ironically due to delays it ended up costing that same as the solution with the bus terminal included. There is quite a hike between some locations for catching buses to different areas now. This must impact on transfers and less able travellers. With the solution outlined this still seems to be the case in some areas. Another example of cross town users facing discrimination or a complete lack of services. Would it not be better as some have suggested to bite the bullet and get some centrally located land near Britomart and ferries etc to replace that rashly sold off. Then develop an integrated person friendly centralised bus interchange. If we allow sky city to renege on their inter city bus terminal agreement ( a condition of their development permissions I believe) then that could also go there. Perhaps they could contribute to funding some of it.We often have to live with compromise solutions in this country due to short sighted decisions in the last ( trains having to reverse into Newmarket due to land being sold for apartments). Some port land with some nice architectural design could be a better use than a multi storey car park with a garden on the roof. Another option where hubs are separated would be a series of passenger tunnels or raised gantries with travelators to get users between bus stop areas quickly. I believe one was considered from Queen st to Aotea station at one point. This could also tie in with the Albert park tunnel development. There are a number of options. not all of which need to cost a lot of money. Delivering people to a gully with no real connections is not a solution. Disagree. In 5-6 years Britomart will no longer be the main station on the rail network, there is no need for buses to all go there. The current surface use of Britomart is far better than a park for idling diesel buses. The most important thing for all our CBD bus routes is that they pass either Aotea or Britomart stations and that when the bus routes cross each other transfers are easy. I say be cautious when seeking to criticize AT regarding crossovers because they will have a plan; half a plan; or just the germ of an idea.